The village of Lindos is nestled on the south east coast of the Greek island of Rhodes and combines atmospheric streets, history, art and amazing beaches. This is my guide to the best things to do in Lindos. 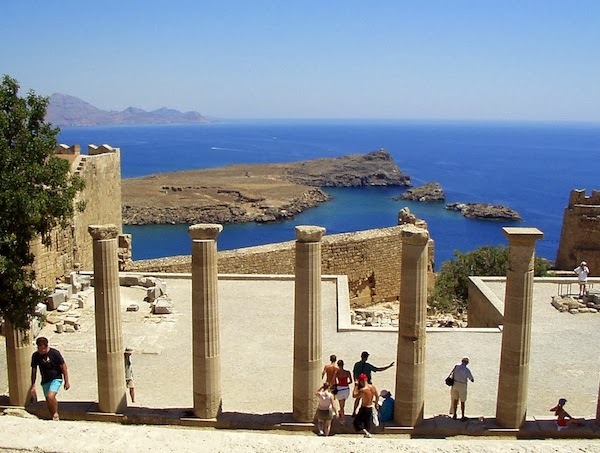 Rhodes holidays provide an opportunity to explore this historic and interesting island. 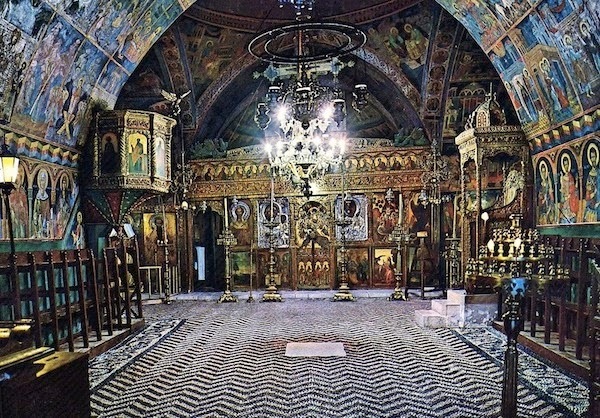 There is so much history that it is easy to forget the beach when you’re looking for the best things to do in Rhodes. 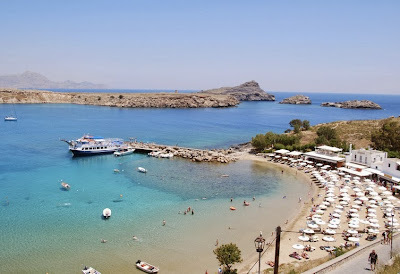 The area around Lindos has some spectacular beaches but St Pauls Bay is the most popular. Boasting sheltered, clear blue water and a seafood restaurant the beach experience here provides everything you need. Up the hill from the beach Lindos village is a network of historic, cobbled streets, all of which are pedestrianised. The main streets offer shops, cafes and bars that come alive in the evening, but the almost secret backstreets also host many gems so it is worth exploring this picturesque Greek village. If you are after daytrips to other locations on Rhodes or watersports, such as diving, these can also be arranged in the village. One such gem is the Church of Panaghia that from the outside is a simple whitewashed church with a red tile roof, but when you go inside you are greeted by an overwhelming display of eighteenth century artwork on the walls. The floor is also a work of art and covered in black and white pebble mosaic. Perhaps surprisingly for a small village Lindos has its own acropolis on the hilltop, built as a temple to Athena. It is another short but steep climb from the village and the first part you approach is the medieval stone walls. At the top you can explore the ruins and fall in love with the gorgeous views over the village, beach and Mediterranean. There is also an ancient ampitheatre to admire. 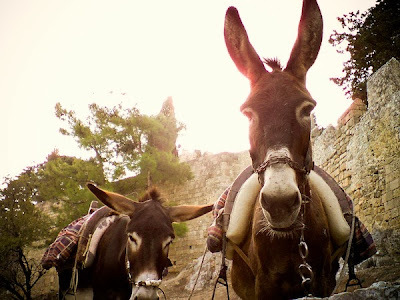 A group of donkeys work hard during the peak tourist season carrying tourists up and down the steep, and uneven, slopes. While it is fun for children to hitch a ride I can’t imagine it is much fun for the donkeys to carry adults up and down the slopes, so I just made a fuss of the donkeys and took advantage of the photo opportunity. Lindos is a charming Greek village and has a surprising amount of things to do for such a small place. I loved it. Have you been to Lindos?